I have recently completed my Physics PhD, after previously obtaining an MSc in Physics (by research, also in the Warwick Glass group) in 2005 and a BSc (hons.) 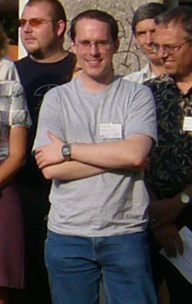 in Physics at the University of Warwick in 2004. My research interests include glass structure, materials characterisation and Reverse Monte Carlo modelling. Apart from physics, my interests include most areas of computing, reading (particularly fantasy, science-fiction and historical fiction) and games of all types. I am currently preparing several papers from my thesis for publication in international journals whilst I consider my future career plans. My PhD research focused on glass systems involving antimony (III) oxide, which tend to have interesting structures due to the lone pair of electrons on the antimony atom. I have worked on the antimony silicate and antimony borate glass systems, as well as vitreous Sb2O3 and an antimony oxychloride glass. I am also interested in the behaviour of the related antimony oxide and antimony oxychloride crystals, which are themselves interesting from a structural perspective and exhibit a complex thermal behaviour. I use a wide variety of techniques in my research including X-ray diffraction (XRD), thermal analysis techniques (DTA, TGA, DSC), Raman spectroscopy and neutron diffraction. I also have some experience in using Reverse Monte Carlo (RMC) techniques to model the structure of vitreous GeO2 and will extend this work to encompass more of my samples in the future. My principal collaborator outside of Warwick are Professor Alex Hannon at the ISIS facility; I am also grateful to Dr. Gavin Mountjoy at the University of Kent for his help with RMC modelling, and to Dr Mike Thomas (University of Liverpool), Professor Dennis Brown (Northern Illinois University) and Professor Charles Johnson for Mössbauer spectroscopy measurements of some of my samples. In July 2007 I spent two weeks at Coe College, Iowa, USA, visiting Professor Steve Feller and making use of the excellent glassmaking and Raman equipment available within their Physics Department. My research is funded by a grant from the Engineering and Physical Sciences Research Council (EPSRC). From October 2004 to March 2007 I was a demonstrator/marker for the 1st Year Undergraduate Physics labs at Warwick and in October 2006 I also undertook the co-supervision (alongside Dr Diane Holland) of two final-year undergraduate students on their research project involving antimony silicate glasses. One of them was even inspired enough to come back for a full PhD. I attended the school to improve my theoretical understanding of neutron scattering. September 2007 - Paper published: "Thermal phase transitions in antimony (III) oxides"
This paper brought together the work from my MSc thesis on the antimony oxide crystal samples, with comparisons to previously published data, and included suggested 'flow diagrams' for the thermal behaviour of the two Sb 2O 3 polymorphs. Abstract and full text are available on ScienceDirect. Full reference: R.G. Orman and D. Holland, J. Solid State Chem., 180 (9), (2007), pp. 2587-2596. January 2007 - Current Challenges in Liquid and Glass Science Workshop, Abingdon, UK. I presented a poster entitled "Determining the Structure of Antimony Oxychloride Glass" ( PDF , 332k). October 2006 - ISIS Disordered Materials User Group Meeting, RAL, UK. I gave a talk on my work on the structure of antimony oxychloride glass. This had essentially the same content as the one given at the 8th ESG Conference ( PDF, 681k) although it was presented to a different audience. September 2006 - RMC-3 in Budapest, Hungary. I presented a poster on my work on the structure of antimony oxychloride glass ( PDF, 196k), which I hope to investigate further with Reverse Monte Carlo techniques. September 2006 - The 8th ESG Conference in Sunderland, UK. A paper on my work on the structure of antimony oxychloride glass was presented and has been submitted for publication in the European Journal of Glass Science & Technology Part B: Physics and Chemistry of Glasses. The talk was entitled "The Structure of Antimony Oxychloride Glass" ( PDF, 681k) - note that the Rietveld refinement graph on page 14 is incorrect. MSc Thesis: "Phase Transitions in Antimony Oxides and Related Glasses"
September 2005 - SGT Annual Conference 2005 in Sheffield, UK. I gave a talk on some of the results from my MSc thesis at the "New Researchers' Forum on Glass". The talk was entitled "Phase Transitions in Antimony Oxychloride Glass" ( PDF, 741k). April 2005 - GLAMOR 2005 at Trinity College, Cambridge, UK. I presented a poster on some of my MSc work on phase transitions in antimony oxychloride glasses ( PPT, 1.6MB). Much of the analysis of the data in the poster was later revised for my thesis in the light of further experiments. I can be contacted through Diane Holland (d dot holland at warwick dot ac dot uk).